As a police officer spanning 21+ years of service, I worked night shifts more than any other. Without a doubt the piece of equipment I used most often was not a gun or a radio or a set of handcuffs. It was a flashlight. Had the HDS Systems EDC Tactical light been available at the time, it would have been my flashlight of choice. 1. Its small. The EDC (Every Day Carry) Tactical is a small light at about 3 3A inches long and 1 inch in diameter, making it a perfect size to have with you at all times, whether you're a uniformed officer or plain clothes investigator on or off duty. 2. It lasts. It runs on one long-lasting CR123A lithium battery. These batteries are now common and are available most everywhere these days. A rechargeable battery kit is also available from HDS. The light source is a single LED that you won't have to replace. The body of the light is durable aluminum with steel bezel that will take being dropped repeatedly. 3. It's powerful. The model I tested is rated at 325 lumens in the brightest mode. Thafs brighter than any 5 D-cell light I used to use. A less expensive 250- lumen model is also available and still provides more than enough light for most situations. 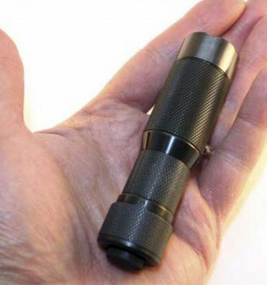 OK, lots of small, powerful LED flashlights are on the market these days. So why does this one stand out? What separates the EDC Tactical from the competition in my opinion is the way this light functions through its different modes. There is the typical push button switch in the tailcap, although tailcap isn't the right word because the flashlight unscrews to access the battery compartment at about the mid-point. THINK I FOUND MY NEW FAVORITE FLASHLIGHT. The tail end of the light is actually a rotating dial. With the dial rotated fully clockwise, pushing the button will give you momentary-on maximum brightness. Release the button and the light goes off. Ifs a setting thafs easy to remember and easy to find by feel in the dark. The EDC Tactical runs on one easily replaced CR123A lithium battery. An optional kit with rechargeable battery is also available. Its perfect for when using a 'Hash and dash" technique — a brief flash of light to reveal threats and obstacles and then moving in the dark with the light off to prevent you from being an easy target. Back off that rotating control slightly from full clockwise and pushing the button gets you to the momentary-on blinding strobe mode. Starting at the full counter-clockwise end of the rotating dial you have the variable constant-on settings. Adjusting the dial clockwise little by little takes you from the dimmest glow through multiple brightness levels to strobe to maximum There are not just one or two brightness settings. I counted 12. This is especially appealing because many times you don't want or need the maximum brightness. You might be merely filling out a report or you might be engaged in the more serious business of moving into position for a tactical operation. Preserve your night vision, save your battery and don't give away your position. Go with a lower brightness setting. You don't want to be fumbling with dials or trying to remember a sequence of button pushes to reach different modes on a tactical flashlight. It has to be easy to use under stress with gross motor movements. That's where the EDC Tactical really shines, literally. Say you're jotting down some notes and your light is on a low brightness setting. Suddenly someone, a possible threat comes out of the darkness toward you. With your light already at constant on, you have only to push the button with your thumb and your light instantly goes to momentary-on maximum brightness. Release the button and you automatically go back to your constant-on lower setting. No fine motor skills are required, no complicated drills to remember. A double click of the button with the light on allows you to toggle back and forth between the constant-on dim setting of your choice and constant-on maximum brightness. When your battery is getting low, the flashlight will turn off momentarily, then come back on at one brightness setting lower. This will repeat as the battery continues to be depleted. When the battery is no longer capable of maintaining a 50-lumen output, the light will double blink once every two minutes as an indicator that the battery needs to be replaced. I don't think this HDS light should be relegated to mere backup light status. My days on patrol are over, but if this light had been available when I worked the road, I would have carried two of them: one as my primary and a second as a backup. It does everything I need a light to do without taking up a lot of room or weighing me down. I'm still a flashlight fanatic. I use them on camping trips and back-country hunts. I carry one whenever I go out as a companion to my concealed carry handgun. Until something better comes along, this is now my go-to light. EDC means "every day carry." A light, a knife and a handgun are some of the things an officer should think about having on him at all times. Early in my police career, it was necessary to carry a large light for a couple of reasons. First, there were no small lights available that were sufficiently powerful to really light up an area enough to reveal possible threats. Second, our issue batons were nothing more than long wooden sticks. You had to remove it from the ring on your duty belt before taking a seat in a vehicle. That meant that when you had to dash out of the car in a hurry you usually grabbed your flashlight first and the baton often was left behind. Later, we were issued collapsible batons that could stay on your duty belt even when seated in a vehicle. And advances in technology saw the introduction of small, powerful flashlights. It no longer made sense to carry a long, heavy light. Weighed down with full duty gear, including body armor, it was hard enough to catch a suspect in a hoodie and basketball shoes in a foot chase. You need to have your hands free on a moment's notice, whether to handcuff a suspect, wrestle a drunk or help to carry a victim to an ambulance. A small light rides easily on your belt or tucks away in a pocket. Ifs there at all times, even on the day shifts when you suddenly find yourself searching the dark basement of a vacant building.